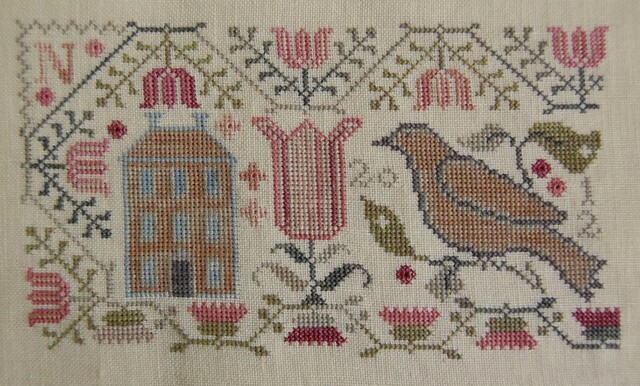 Nicole's Needlework: Spring's Song Finished! I just finished it today. I love how it turned out! Now, I'm going to get back to Elizabeth Mears and hopefully get her finished up soon! This turned out so pretty! Love the colors. Congratulations! I love how it turned out, too. Are you going to use it as the box lid? How pretty!! Those BBD colors are so soft and nice..... Can't wait to see Ms Meares all done!! It's so pretty Nicole. The colors are very pretty. And looking forward to your Elizabeth finish. I almost pulled mine out today and started on it, but put it back. Maybe soon! Such pretty colours Nicole. The fabric you've used looks really rich & warm. So pretty, Nicole! I love it! Very pretty!! I need to really work on mine! Your finish is beautiful. Don't you just love it when you finish one?! Not only do you feel you've accomplished something, but now you get to start on a new one! This sweet design is popping up on several blogs and I understand why...it's lovely, Nicole! And your stitching is beautiful as always. Can't wait to see your Elizabeth completed! Holy Cow Nicole! I have the box and the fabric...but that's all! I really want to take stitching lessons from you! :) It's beautiful. Did you use the silks it called for? sorry...not the silks...but the threads it called for? I love it, the colors are so wonderful! Beautiful Nicole! I just love these colors too! You are tempting me here lol. Nicole, this is just gorgeous! I just received this chart in the mail today and was happy to see your finish at the same time. 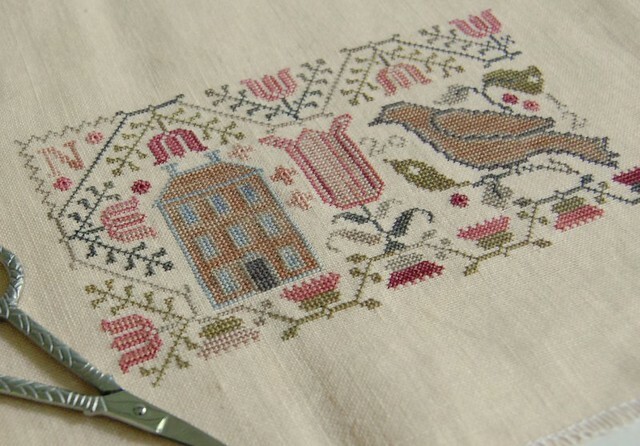 Definitely a must-stitch! Beautiful finish Nichole!! Glad you had a wonderful time on your vacation and got some stitch time with new friends!! Priceless! OHMYGOODNESS!! SO gorgeous Nicole, I love it! Is this from the newest Loose Feathers leaflet? Gosh, I can't get over how pretty it is, love the colors! Oh, how delicately beautiful! The colours are amazing! What a lovely finish! Love the colours. Great finish. I have been on the fence about this one, but now I have seen your finish I will be adding it to my wish list. So sweet!!!! I just love this little piece. I think I am going to frame mine instead of the box??? I got the box too just in case :-). Gorgeous finish!! Such lovely colours in this BBD!! Oh, how pretty! Woo Hoo, you! I love the colors in the design. Congrats on another great finish! First one I've seen, and it is very pretty! Will it be a box top, or do you have other plans and ideas? Very cute, Nicole, and that was a quick stitch !! Love it! Great finish, Nicole! Such a sweet finish!! Love the softness of the colors!